It happens time and again, the Royal Navy having no option but to send a tiny vessel to ward off a much bigger Spanish ship which makes an incursion into British waters. These cannot be classified as 'innocent passage' because they keep happening, Spanish n ational anthem included. It must now be years of the same spectacle and the same ineffective response from Britain. If they think they can send warships into our waters, and quite close to the Rock, why doesn't the MOD send British warships into Spanish waters, going round the bay? The latest incident has made news in some UK papers. 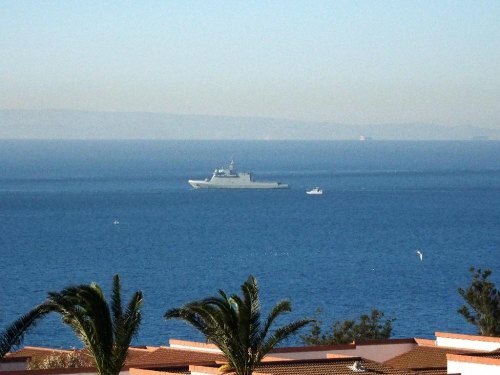 One referred to a tiny 50ft Royal Navy vessel being sent to handle a 300ft Spanish patrol ship after a two-hour stand-off when the larger craft gate crashed a UK training exercise off Gibraltar.